Cloud Track Trader Review - It Won't Make You Money! Cloud Track Trader by James Christian claims to be a trading software that can make you $1,250 a day, but don’t be fooled. It’s a generic binary trading software scam, and I’ve had multiple readers who lost between $250 to $500 to it. Read the full review for details. 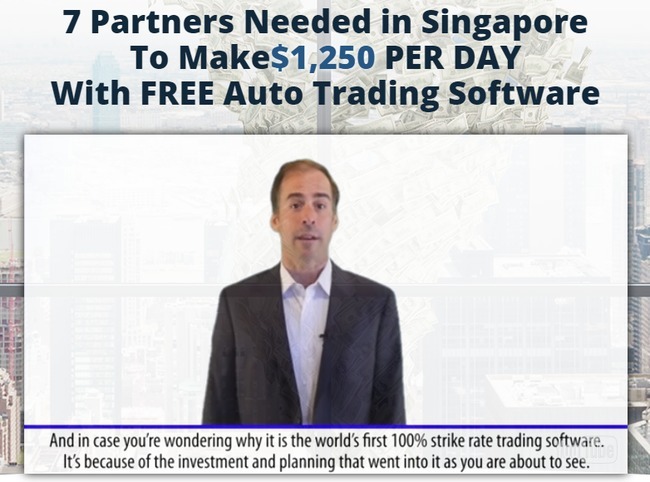 In the sales video, the alleged founder of Cloud Track Trader, James Christian claims that his software is the first 100% strike rate trading software that can generate $1,250 daily profits for its members. By 100% strike rate, it means that his software will never make a losing trade at all. As amazing as it sounds, it is just a blatant lie to lure victims into the fraud. Unfortunately, money lost with Cloud Track Trader software cannot be retrieved. It’s considered trading loss, just like you can’t recover losses lost in bad trades. Victims can only hope to withdraw what’s left in the trading account, which is often just a fraction of the initial deposit. What Exactly is Cloud Track Trader? Cloud Track Trader is an automated binary trading software that places trades for its users on autopilot. Just as the name suggests, an auto-trader uses a software algorithm to trade binary options for its users. In other words, you can activate the software and leave it alone, and it’ll still generate trades for you automatically. While it’s a good thing to remove emotions from trading, these auto-traders will never generate any profits for its users. For one, binary options itself is an extremely risky trading instrument, so much so that Forbes warned us against gambling with binary options. Yes, Forbes used the word “gambling”. In fact, more than 90% of binary options traders lose money due to the nature of the trading instrument. If he ends up winning, he can pocket a $60 to $80 reward. If he ends up losing, he losses the entire $100 that he bets. The odds are clearly against the traders. Will you bet $100 in a coin toss game to potentially win $60 to $80? Even though software like Cloud Track Trader claims make guaranteed profits for you, it is actually generating random trades for you and make money from your losses. Don’t fall for the scam. I’ve gathered a few evidence to show that Cloud Track Trader is a scam, so here goes. Let’s start with the alleged founder of Cloud Track Trader software, “James Christian”. He was actually hired to promote a previous scam using the identity of “Matthew Shepherd”. In fact, Cloud Track Trader is just a re-branded Cloud Trader scam that I have reviewed earlier. They have reused pretty much all the sales material, save for the slightly different sales video with the same actor in it. Similar to Cloud Track Trader, the previous Cloud Trader scam promised to make its users at least $1,250 daily profits. The result? It has became an infamous junk software that losses money for its members. To prevent new victims from finding out the previous bad reviews, the scammers had to change its name and re-brand it into Cloud Track Trader that we see today. In Cloud Track Trader’s website, there’s a section where they show what seems to be genuine Facebook and Twitter feeds about the software. Each and every of these posts give a positive review for the software. Most victims take it as real feedback from existing users, but it’s actually just another trap laid down by the scammers. Try clicking on any profile or link within the posts and tweets. You’ll realize that unlike real posts, you can’t interact with any of the posts displayed in Cloud Track Trader’s website. There isn’t even a cloudtracktrader account on Twitter! This is actually just a wall of text formatted to look like Facebook posts and Twitter tweets. None of the profiles and comments is real. If you want to verify the authenticity for yourself, you can look for any of the names shown in the page on Facebook or on Twitter. You won’t find anyone with the name and matching profile picture. When you register on Cloud Track Trader website, you are actually registering for an unregulated broker account, which is affiliated with Cloud Track Trader. The losses are pocketed by the broker, which is then shared with its partner-in-crime – the scammers behind Cloud Track Trader system. CLOUD TRACK TRADER IS A SCAM. I strongly advise you to stay away from the scam if you don’t want to lose your hard-earned money. Well I thought using a software would’ve improved my trades. Guess not huh..
It’s true, I regret signing up for this kind of software. I sent email to withdraw my remaining fund but they won’t even reply me! Try calling their support line and follow up on the withdrawal. You are entitled to get back your deposits.